Receive unlimited alcoholic and non-alcoholic beverages on board any Europe river cruise. Click here for eligible departures. Single travelers pay no supplement on river cruises in Category 1 cabins. Click here for eligible departures. Single travelers receive $1,000 per person off the single supplement of select river cruises in certain cabin categories. Click here for eligible departures. Offers subject to change or withdrawal, availability is limited. Some offers are not combinable. 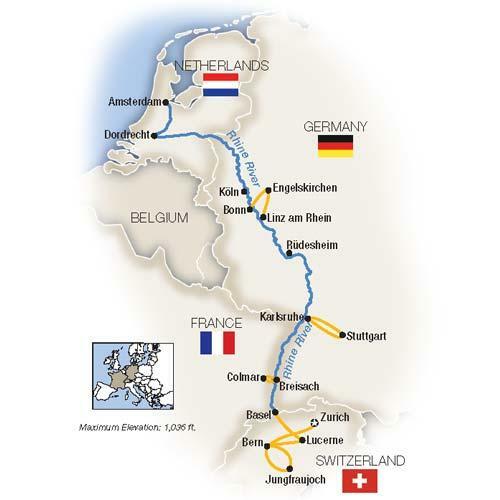 Our Swiss Alps and Rhine cruises follow the romantic river on its winding journey from Switzerland to the Netherlands, with a 7-night cruise plus two nights in Bern. You'll experience medieval winetowns, cathedrals, castles, museums, and river landscapes of the kind that inspired JMW Turner and Richard Wagner. Begin with a two-night stay at a luxury hotel in Bern, with an idyll in Lucerne; then sail from Basel with visits to Colmar, Stuttgart, Rudesheim and Cologne... a Tauck Exclusive evening of dinner and music at Schloss Ehreshoven... a visit to the windmills of Kinderdyke, and exploration of Amsterdam including a canal boat tour along the city's historic waterways or a walking and tasting tour of the city's Jordaan district. Itinerary Changes – although not expected, Tauck reserves the right to alter the sequence of ports or omit or substitute scheduled ports or attractions at any time without prior notice. North and south itineraries are similar. Museums and attractions may be subject to closure due to state, local or religious holidays. This cruise includes a fair amount of walking.